This is a transcript of a podcast interview with Professor Victor Montori @vmontori conducted by Casey Quinlan @MightyCasey. Recorded at the Cochrane Colloquium 2018 . Listen to the podcast below. All right, Casey Quinlan with the #BeyondTheRoom Team here at #CochraneForAll with Victor Montori, folks. So Victor you’re closing this colloquium. You are one of the closing keynotes. I am really looking forward to this. One of your messages in your work and also in your book, “Why we revolt” and your overall patient revolution is shifting from trickle down to bubble up in health care. And I wanted to ask you how might we shift from trickle down to bubble up in both research priorities and evidence dissemination? – since we’re Cochrane, and this is an important topic. So how do you see that unfolding? Yes, it’s a very difficult question because, first of all, the issue of trickle down is that we focus on the evidence, we focus on producing the evidence, we focus on synthesizing the evidence and then we get excited about translating the evidence into practice. All these efforts are efforts to try to bridge the knowledge-do gap. But people at the frontline, that’s not their main concern, their main concern is not to bridge the knowledge-do gap, the main problem at the frontline is how to solve the problems of the patient. So what is going on with your situation, what makes it complicated and difficult, and it often is not a lack of evidence, it is often not a lack of knowledge, it is often that your situation is intrinsically difficult, is intrinsically uncertain and then the clinician and patient have to draw on everything they can, their own experience and expertise, for instance, to try to address that. Evidence there has a major role to play. And they can draw from evidence to understand, for instance, what not to do, what should not be on the table, and to try to gather some reasonable expectations about the ability of the alternatives, to try to move the situation forward. So the real challenge is patients and clinicians drawing on evidence to care. For those who produce evidence, to start from what we don’t know and how do we bridge that gap, is the wrong starting point and then to focus on translating that evidence into practice, because it is not being picked up… Duh… It is not being picked up because it never started with the problem of the patient, it started from what we wanted to know. So, I think the main issue about trickle down versus bubbling up is researchers have to start with an understanding of what is the problem we are trying to solve, and the place to know that is the clinical encounter: the place to know that is the home of the patient, the workplace of the patient, is where the patients are struggling to, you know, adapt and cope and thrive. And it’s from there that the questions come up. And I would hypothesize that this would be a lot less difficult to use that evidence to care, when that evidence was produced in response to a problem of care. So, how can patients help with this effort? Well, as you know, I am allergic to finding more work for patients. Right, and my instinct as a clinician is to actually think of ways of caring for patients first, rather than think of errands they could run on my behalf or on behalf of our partnership. 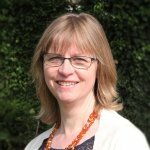 I do recognize that not all patients are the same and not all patients are prepared to cope with their problems in the same way and some of them cope better, do better, when they become very actively involved not only in their own condition but in the general challenges of the condition they have. And so they could play a major role. But their role is not to participate in the process of trickle down EBM. Their role is not to be a token or no token participant in research groups or participant in guideline groups. That’s too late in the process. I think we need to partner with patients and clinicians at the frontlines to uncover what are the real knowledge gaps, what are the real practicegaps and start with those practice gaps to build up our knowledge base, to build up our evidence. How do you think Cochrane researchers can more effectively involve patients in the ways that you’re outlining? And then also measure the impact of that patient participation? Yes, so how to do, I think is a subject of experimentation. Right, we need to continue to develop a practice of doing this and, in doing so, learning by doing. Learning and trying and trying again and doing it again. I think we are in the early days of that partnership. And as we have seen in this colloquium, there’s been some incredible accounts of patients participating or guiding the research programme and fortunately many of those situations is when the researcher, him or herself, is the sick person. And embodying both situations has led to some remarkable things. Can you imagine if we were to start that journey together, like when it happens to the same person. So I think that is the subject of further experimentation. I don’t know that I can tell you how to do it, until we have more evidence. The second part is how to measure the impact and I think the question we need to ask about this is why are we involving patients, why are we engaging patients and clinicians in this process, before we decide how we’re going to evaluate. This is like transparency or honesty or other things that are nice to have but as an organisation or as a way of doing things, when you say we want honesty, we want transparency, we want this, they can be articulated or justified on the basis of first principles, but it is much more interesting to say we want this because we are pursuing that. So, we want engagement because we are pursuing what? What do we want? Do we want legitimacy of being able to say the patient has participated? Does that improve the trustworthiness of what we are bringing? Does that improve the applicability of what we are bringing to the table? So, in other words, are we using the patient’s presence to improve the valueof what we are trying to create? Is that what we are after? Or, is it more about pertinence. Is it that the reason the clinicians and patients are at the table from the beginning is because we want them to be able to draw from what we’re going to produce, to actually care. And if it’s the latter, then the impact of that engagement is in the ability of the people at the frontline, the people that are providing care, receiving care, people that are caring for and about each other, their ability to draw from evidence and formulate plans of care that make sense. That’s the ultimate proof. Not whether the project was completed on time, on budget and looks good on the printed paper. So what has been your impression? This Cochrane colloquium is #PatientsIncluded. 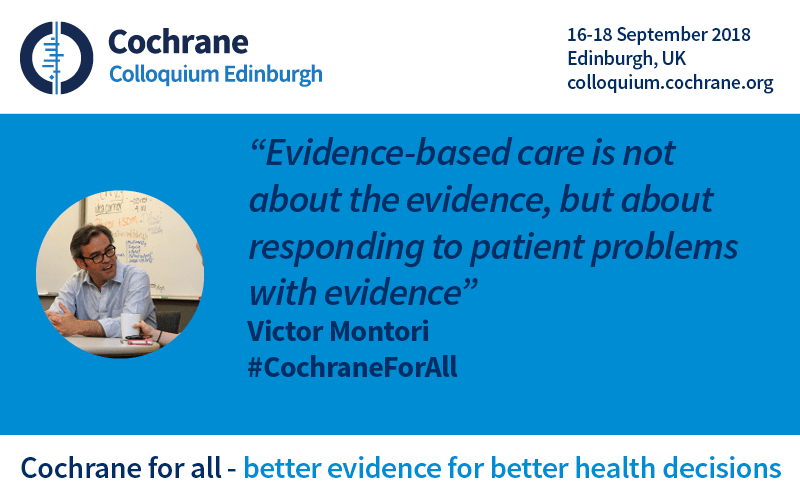 What has been your impression of the ‘patients included’ transparency at #CochraneForAll? Well, first of all, this PatientsIncluded tag has been evolving in what it means over the years. Increasingly, we are becoming intolerant to tokenistic involvement. So that, I think is major progress. You don’t get the impression here that they just got the ability to use a tagline and forgot about it. And there has been, in the sessions that I have participated in, patients, caregivers have been able to not only participate from the podium and from the stage but also from the public asking questions and there have been multiple ways of asking questions and participating in the sessions both in person and through social media. And there is also quite a bit of dissemination, almost real time, of the content of those presentations again through social media and other things that facilitate, like technology, and folks who are limited in their ability to travel and participate or frankly scared by the price tag of participation, have a chance to actually be included in the deliberations, not only as passive consumers of what is being produced but also actively shaping it through their questions. That’s remarkable. Yeah, bunch of dudes talking about reproductive women’s health, or whatever. Right, and it’s the same thing that I think over time, organisations and groups, that have to complete tasks, realise that they cannot fulfil their mission in ways that are effective, without adequate and full participation of those who are acting on their mission and are the subject of their mission, the target of theirmission. If Cochrane wants to be an active contributor to the process of care, then not only patients but also clinicians have to be included and they have to be included from the moment the questions bubble up all the way to the moment where we get together, like in this colloquium, to celebrate our accomplishments. Yeah, “Nothing about us, without us”, is not just patients. “Nothing about us, without us” is also researchers and clinicians. All in a group or perhaps in their individual tribes but then coming back together for tribal councils, like, I don’t know, #CochraneForAll. So one of the things, one of the things we sometimes forget is that, if we are doing this to help the end users – here the clinical consumers, which I think is a problem but anyway – the end users pick up this evidence and use it to care, we must recognize that there are different kinds of users, and so when we say we want consumers to be involved, I think it is very narrow, surprisingly, to think of patients only. Patients are the ones who are often excluded from the room but we tend to believe that because we have an expert diabetes doctor on a panel, that we have clinicians already there, and there is increasingly a big distance between experts that participate actively in the academic process and clinicians who are at the frontline with the patients, trying to make sense of things. And those people have to be involved. And the same thing happens with policy makers. If you want policy makers to be sensitive and use evidence to derive policy, then policymakers also need to be included in these sorts of events. Yeah, yeah. I kinda like the word people, instead of say, consumers. That doesn’t sort of exclude anyone, does it? I know. People. It could…just people. Yeah, I think the generic nature of it might actually reduce the focus on including patients and so on. Again, there is no right term. But I think being conscious of who we’re trying to help and making sure that those we are trying to help are part of the process from the beginning, becomes a guiding principle. Well, from the #BeyondTheRoom team and #CochraneForAll, I thank you Victor Montori, for both the work you do and for talking to us today. Thanks. Thank you very much, MightyCasey.